Dragon Gate Henderson real estate in MacDonald Highlands hillside development offers luxury estate homes. This exclusive ridge of homes for sale in Henderson has incredible views of the Las Vegas Valley. The neighborhood at Dragon Gate high elevation provides views of the Las Vegas Valley and its mountain ranges, intended for custom home multilevel estates. Sales have been strong with half of the real estate sold before construction. Three Henderson lots for sale are available for purchase. With an average of one half acre each, three stepped lots are available. Several upper hillside parcels of land are available for sale with the largest being one acre. MacDonald Highlands real estate in Henderson, a hillside luxury real estate development, within Las Vegas, with custom elevated mansions. Average luxury hillside Henderson homes square footage is running about 8,000 square feet with some Henderson luxury home owners constructing 25,000 to 35,000 square foot mansions. Luxury Henderson home sites in MacDonald Highlands measure from one-half acre to 2 1/2 acres. The subdivisions offer mountain and Las Vegas city views. MacDonald Highlands Henderson real estate opens its gates to luxury real estate in Las Vegas. A special viewing of nine estates homes for sale in Henderson and three Toll Brothers semi-custom homes for sale in MacDonald Highlands real estate from 1 to 4 p.m. Some of these luxury Las Vegas homes for sale are built into the MacDonald Highlands hillside and features fantastic views. Some luxury custom estates are next to DragonRidge Country Club. 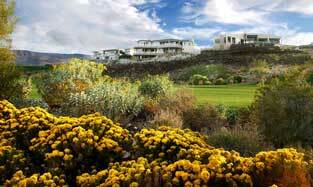 DragonRidge Country Club is the developments private Las Vegas golf course. This is a great opportunity for someone to purchase a luxury Las Vegas home in the $1 million to $5 million price range.